ANOSAN TW® offers a safe, instant microbiocide and fungicide in any pipes and any temperature of water. It can be used with no interruptions of water usage or special precautions, is pH neutral and does not cause precipitation of lime. Our solution can enter water systems safely with no additional safety measures, while also being effective against hormone & antibiotic residues. 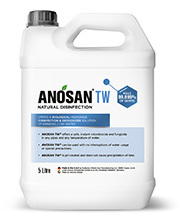 Water disinfection in pipes of various buildings, health facilities, and family homes all benefit from ANOSAN TW®’s effective removal of biofilm with no evacuation or special precautions and providing water safe enough to drink. Legionella infection of pipes can also be countered with ANOSAN TW® and with no structural changes or evacuation necessary while maintaining healthy pipes. ANOSAN TW® is non-toxic and can be used with the presence of aquatic life, enhancing the marine environment and removing pathogens, toxic algae, and viruses that often end up reaching publicly used water areas, such as beaches through treated sewage water or shipping vessels.